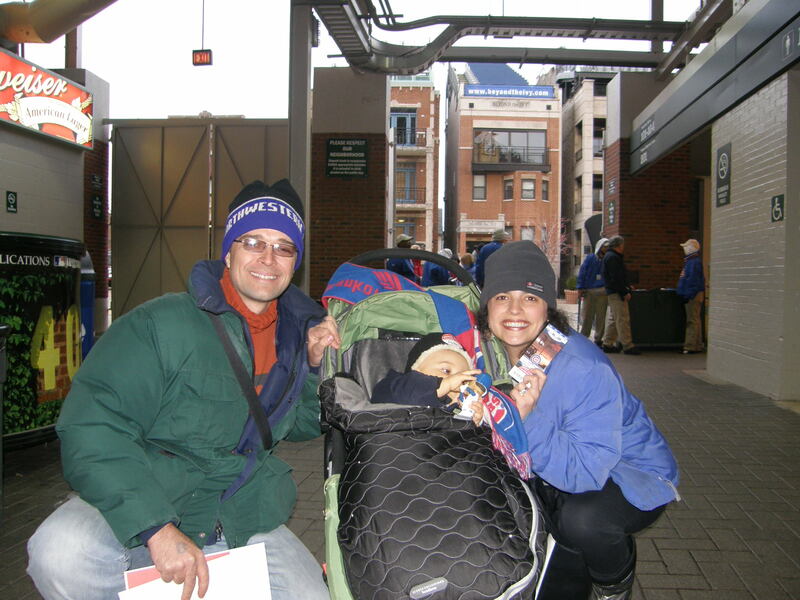 Ultimate Sports Baby Walks at Wrigley Field | Have Game? Will Travel! Since I had tickets for the second game, but would not receive a refund, I walked home in order to get re-organized and change the Ultimate Sports Baby. Plus, by re-entering Wrigley Field, I could finally receive a promotion – the Tyler Colvin bobblehead. This was probably the main reason the Cubs kept the games as a separate ticket so fans from Tuesday night could get their prize. But, people need to stop being so lame about collecting promotional items. It is mostly junk you will probably throw out at some point. The friend that I invited to the game cancelled on me late in the day so the Ultimate Sports Wife decided to attend the game instead. Since the game started early, she waited in the house to rest before bringing the Ultimate Sports Baby to the game. Thus, Dylan attended his first baseball doubleheader. Throughout Game 2, the Ultimate Sports Baby was walking around the concourse of the standing room only area. Although he had figured out how to walk longer distances while we were in San Francisco, he decided he was going to motor around Wrigley Field tonight. Given the Ultimate Sports Baby’s new motor skills, I did not watch much of the game on the field. The Padres defeated the Cubs 5-4 as they hit three home runs.